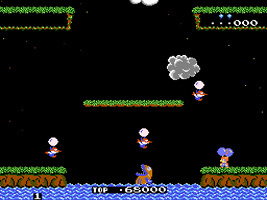 The arcade version of Balloon Fight, which was released a little earlier than the home console release. This version features a few differences to the home console version, including vertically scrolling stages and two flying speeds. The arcade version only features the 1P and 2P games, and does not include the Balloon Trip mode.